People from all walks of life and all ages join our trips. We get a mix of couples, singles, families, and friends usually between 25 and 60 years of age. Our Family MagicTM trips host kids as young as five and we've taken folks that are in their nineties. Some have never been camping and others have extensive wilderness experience. Some are physically challenged. Some are very active and some are not. Without exception everyone comes to have a good time and the variety of people and interests found on each trip makes it all the more fun. Our adventure consultants know that a primary consideration may be the mix of people on the trip, so we're happy to tell you who has signed up and help you choose a compatible group. What is the typical trip size? Most trips include at least ten guests and a maximum of 14 to 28, depending on the trip. One-day trips may have 30-42. Our average trips size is 16, but trips in May, early June, and September are generally smaller with 8-12 guests. Let us know what size group you&#39;d like to be with, and we can tell you which trips are likely to be full and which are likely to be smaller. Which trips are best for me? Much of this will depend on how long of an adventure trip you want and what time of year you can go. Our Missouri River canoe trip is a wonderful river trip with no whitewater. You'll find mild whitewater on the Grande Ronde or lower Owyhee. 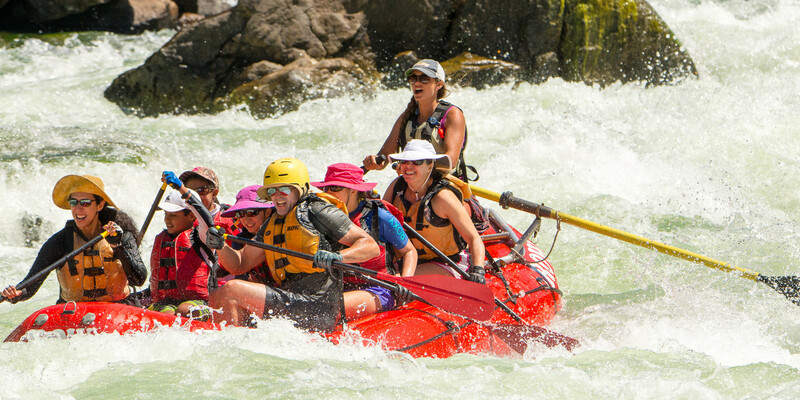 Intermediate whitewater trips include the Snake in Hells Canyon, Salmon River Canyons, Rogue River or the Middle Fork of the Salmon (from July 6th on). More advanced trips would be the Middle Fork in June, the Bruneau, the Middle or Upper sections of the Owyhee. For shorter trips, the Moyie, St. Joe and Clark Fork are good choices. The Lochsa is enjoyed most by experienced rafters; however, if you're confident in the water, healthy, and feel adventurous, it could be a good choice. Note that we have trips that combine time on the Lochsa with time on other rivers. While a few rivers we run get too low to float after the spring snow melt is gone, most have plenty of water all summer long and into the fall. While there is no lack of exciting whitewater throughout the summer, it is generally true that the high water of May and June creates the season's most thrilling rapids. September is also a great time as there are fewer people on the rivers and fall colors are beginning to show. The ROW style of camping is very comfortable. On most trips a cargo boat travels ahead to set up your spacious tent and a complete kitchen area. We provide thick sleeping pads, nice sleeping bags, flannel liners and pillows. Meals are served at tables with chairs and we do the dishes. Solar showers offer the chance to wash up during the trip. Summer nights in Idaho, Oregon and Montana are typically warm and some guests enjoy sleeping under the stars. If you're still concerned, give us a call. ROW is firmly committed to the responsible stewardship of the rivers we run and the earth at large. In our office, at our warehouses and on the river we abide by the 3 R's - Reduce, Reuse and Recycle. On the river we take every possible precaution to minimize our impact. Everything we carry in, we carry out. We build our fires in metal fire pans and carry out the ashes. On many of our summer trips, frequent swimming leaves you feeling clean. For those who want to soap up, we always do so well above the river's high water line (not even "bio-degradable" soap goes in the river). We also take sun-showers on many of our trips and the hot water is great for shampooing and taking a sponge bath. Buckets of river water help with the process. At each camp we set up a special, private tent with a portable toilet inside, which works just like yours at home, without the flush. This is available from the time we get to camp until we leave the next morning. The views from our toilet locations are simply inspiring. Nearby we set up a hand washing system. During the day, liquid waste goes in the river by simply wading into the water or going for a swim. A day-use toilet is available too for solid waste. If you have any other questions or concerns please call our adventure consultants. For feminine hygiene, come prepared with some small zip-lock bags. These are useful for disposal during the day while on the river and can be put into our trash containers at camp. Along with our toilet supplies, ROW will have extra pads and tampons available. Using portable toilets allows us to carry out all human waste. Please see a special letter to women from ROW co-owner Betsy Bowen. Are there bugs and snakes? Mosquitoes are rare or nonexistent on the rivers we run. There are sometimes bees and flies and it's a good idea to bring some repellent. If you have a bee allergy be sure we know and bring your own medication. Snakes are also rare, especially during the heat of summer when they tend to come out only in the cool of night. They fear us more than we fear them and do a good job of staying out of sight. You'll find a wide variety of weather during the season although, in general, the trips we run are warm and sunny. In May and June the weather is more variable and can range from short snowstorms or rain and 40 degree weather to sunny with blue skies all in the same day. The same is true in the fall. July and August do have the most consistently good weather with daytime temperatures reaching 100 degrees. However, a rainstorm can happen any time and it's important to bring a two-piece rain suit and follow our suggested packing list for each river. Do you have trips that don't require camping? We are one of a few outfitters that offer a unique wilderness lodge to lodge trip on the Rogue River in Oregon. During the day you raft through the Rogue River's splashy rapids and stay in warm comfortable lodges in the evening. You can stay at our River Dance Lodge on the banks of the Clearwater River and enjoy a four or five day all inclusive package that includes, lodging, meals and activities such as, guided biking, hiking, fishing, white water rafting, or gentle float trips depending on the time of year. How fit should I be to go rafting? Is it strenuous? On some of our more challenging rivers where unintentional swimming, long hiking or high elevations are a possibility, a higher level of fitness is advised. Always discuss with our staff if you're unsure what's acceptable for you. If you're still in doubt about your ability to go rafting, or your fitness, check with your doctor before you go. While many trips require little physical fitness, being in good shape will enhance your vacation. I have a family with young children. Can they go? Absolutely! ROW has been running Family Magic trips since 1988, designed by ROW's owners and their children, Mariah and Jonah. Children as young as five are welcome on these trips and only families are allowed. Older children may also enjoy our Snake River in Hells Canyon, Rogue River and Middle Fork of the Salmon trips too. Our Missouri River canoe trips are also wonderful for children. Few vacations offer the opportunity for uninterrupted, quality sharing as does a river trip. I am a senior citizen. Can I go rafting? Yes! ROW has taken people in their nineties on our trips. It's important that you're fit and active and choose an appropriate trip. Many grandparents bring their grandchildren on our Family Magic trips. Special "Elder Rafting" and "Elder Canoeing" trips, exclusively for seniors, are offered as well. I can't swim. Can I still go rafting? Yes! Everyone on a ROW trip wears a Coast Guard-approved PFD (personal flotation device). These are designed to keep you afloat in the event that you find yourself in the river. Many non-swimmers go on rafting trips and they have a great time. It is more important that you are not afraid of the water. Non-swimmers should not go on class IV+ or class V trips. Please call us if you have any concerns about this. Wilderness travel and whitewater rafting have inherent risks and ROW does a number of things to manage these risks. It begins when you first contact us. We'll help you select a trip that matches your experience and abilities. On the river you will find that our guides are carefully chosen, skilled professionals with the appropriate training and experience. We use the best available equipment and give a thorough safety briefing prior to all departures. If you're nervous about whitewater, you might want to start off on our Missouri River canoe trip along the Lewis and Clark Trail in Montana or a milder whitewater trip such as the Grande Ronde. All our guides are certified in first aid and river rescue. Many have had advanced training specific to the wilderness environment in which we operate and are certified as Wilderness First Responders or Emergency Medical Technicians. Thus we are able to cope with most on-river accidents. If, in our judgment, evacuation is deemed necessary we have several options depending on weather and our location. Sometimes we are near remote ranches or roads that we can use to evacuate. We carry a satellite telephone along with a GPS on trips lasting three or more days. (Cell phones don't work in the remote areas where we travel.) We can use these to contact emergency transport, including helicopters. Evacuation, if needed, can take from as little as a couple of hours to as many as 24 hours, or in extreme cases, longer than this depending on the situation, weather and location. What are my chances of falling out of the boat? What should I do if I do? Before you go on any trip you'll be given extensive instructions on what to do if you fall in and how to float in the river. Believe it or not, many people love falling out of the boat. It's exciting. But it can be disorienting and a little overwhelming at first. Many people have taken multiple trips and never fallen in. Some people fall out on their first trip. Follow your guide's instructions and your "swim" could be the most exciting part of your trip! What's a typical day on the river? We do have a complete description of a typical day on river trips lasting three or more days. For shorter adventures you'll meet the team leader at your designated rendezvous place and time. He or she will give an orientation talk, collect your release forms, distribute wet suits if appropriate and then get everyone on the bus. You'll go to the put-in, where the trip will start, and the team leader will give you a safety orientation. Then you'll head to your boat. The boats typically seat six to seven people and a guide. The guide will give you further instruction on how to paddle and how to follow his or her commands. Then you'll head on down the river and have the time of your life! See our Packing Lists for each trip we run. Most people already own the items needed. ROW provides wetsuits and wetsuit booties on all whitewater trips in May and June. Full course meals from lunch the first day through lunch the last day. Trips lasting four or more days, except lodge based trips, include a post-trip dinner as well. One-day trips include lunch only. Professional river equipment including: rafts and their accessories, Coast Guard-approved life jackets, waterproof bags for personal gear, waterproof boxes for cameras, sleeping bags, sleeping bag liners, pillows, thick foam self-inflating mattresses, tents and ground cloths. Wetsuits and booties are provided on all cold water trips in May and June. Also, transportation to and from the river from a designated meeting place as indicated on the trips schedule. Prior to your trip we'll send you a complete packing list of appropriate clothing and optional items such as cameras, water bottles, etc. Since many folks like to learn about the areas they visit ahead of time, we also send a reading list which complements our "on-river" library. It's important to drink plenty when you're outdoors so ROW provides fresh drinking water at all times. In camp there's also juice, herbal tea, black tea, coffee and cocoa. We provide two complimentary sodas and two beers per person, per day and complimentary wine with dinner. If you wish to bring more sodas, beer or other alcoholic drinks to enjoy in the evening, bring them along. We'll have cocktail ice. Can I fish from the rafts? If you're riding in an oar-powered raft on one of our multi-day trips then you can fish between the rapids during the day. We also offer special fishing trips through our fishing division, ROW Fishing Adventures. Yes. On one-day trips we recommend a single-use waterproof camera that you can keep handy with you in the raft. On multi-day trips we provide waterproof camera boxes that fit most cameras and small video cameras.